The U.S. Navy’s MUOS 5 mobile communications satellite is closing in on its operational orbit after an extended orbit-raising campaign following a failure within the satellite’s main propulsion system that required an alternate maneuvering scenario to be worked out for the $340 million satellite. The Lockheed Martin-built MUOS 5 satellite lifted off on June 24 atop the most powerful Atlas V version currently available, enlisting the help of five Solid Rocket Boosters to get the 6,740-Kilogram satellite off the ground and on its way to Geostationary Transfer Orbit. 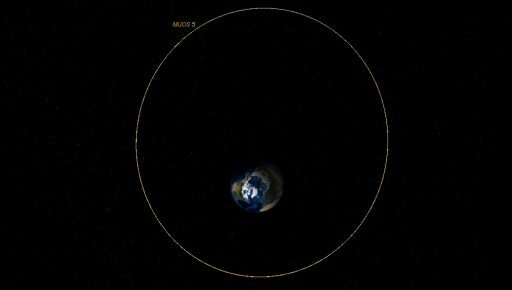 MUOS 5 enjoyed a flawless three-hour ride, being set free into an orbit of 3,903 by 35,654 Kilometers at an inclination of 18.97 degrees. The fifth Multi-User Objective Satellite was set for seven maneuvers to reduce its orbital inclination to zero and lift the perigee in order to reach a Geostationary Orbit where the spacecraft’s velocity matches the Earth’s rotation and allows it to remain centered over the same spot on Earth. By July 3 when orbit-raising was already expected to be complete, satellite trackers found the satellite stranded in an orbit around halfway between the initial transfer orbit and the planned Geostationary Orbit in terms of the velocity needed to make the transition. 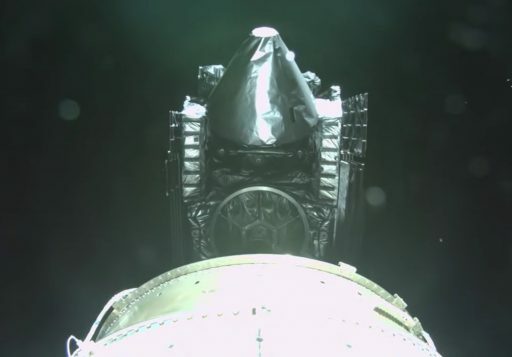 The U.S. Navy confirmed the satellite had to stop orbit-raising and later specified that MUOS 5 encountered a problem with its Main Propulsion System. By early August, the satellite’s manufacturer and its contractors concluded that the Main Propulsion System had failed for good and would not be available for any subsequent maneuvers. 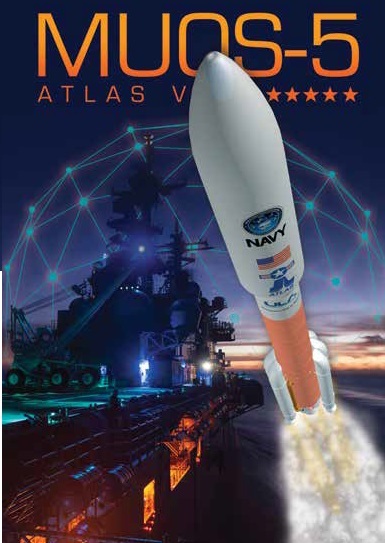 The 6.7-meter tall MUOS 5 satellite combines a bipropellant Main Propulsion System featuring a 450-Newton BT-4 engine from Japan, and a Hydrazine monopropellant Reaction Control System comprising a dozen 1-Newton and six 22-Newton thrusters manufactured by Aerojet Rocketdyne. Without the use of its main engine, the satellite had to rely on its monopropellant thrusters to boost it into Geostationary Orbit – at the cost of later mission lifetime due to the consumption of propellant originally planned for use in stationkeeping once in Geostationary Orbit. 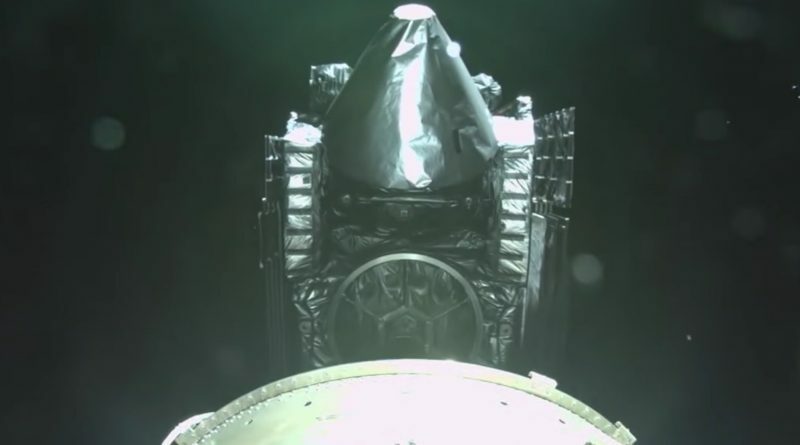 Typically in such a case, the satellite would vent its oxidizer tanks to rid itself of dead weight since the oxidizer, Nitrogen Tetroxide, is no longer of any use and a reduction of vehicle mass reduces the amount of fuel needed to get to GEO. 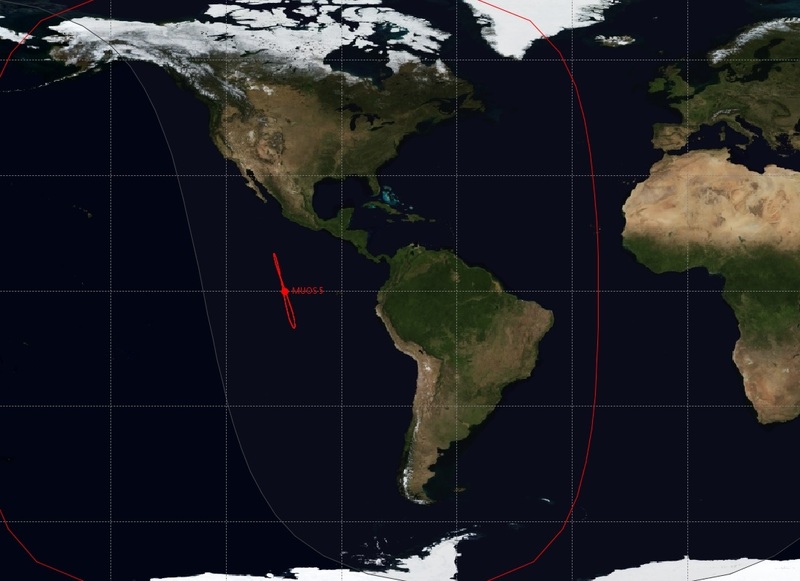 A few test maneuvers were carried out in August and the pace of orbit-raising picked up in September, showing MUOS 5 climbing from a 15,250 by 35,700-Kilometer orbit to 16,100 by 36,680 Kilometers by mid September. Satellite trackers lost MUOS 5 when the frequency and magnitude of orbital maneuvers picked up, but recovered the satellite on October 6 in an orbit of 30,000 by 36,680 Kilometers at an inclination of 9.7 degrees. 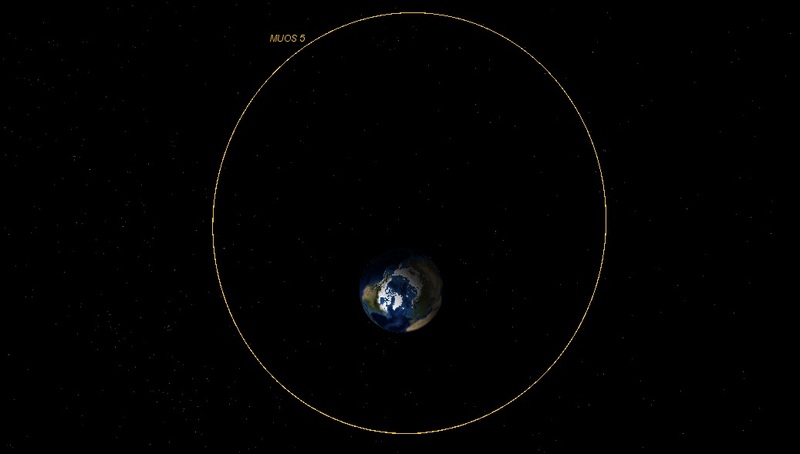 By October 20, MUOS 5 had reached an orbital period of 23 hours and 47 minutes, drifting near Geosynchronous Orbit but still inclined 9.68 degrees. At present, based on October 23 observations, the satellite is almost synchronous, located at 104.8 degrees West, drifting only 0.03 degrees West per day. 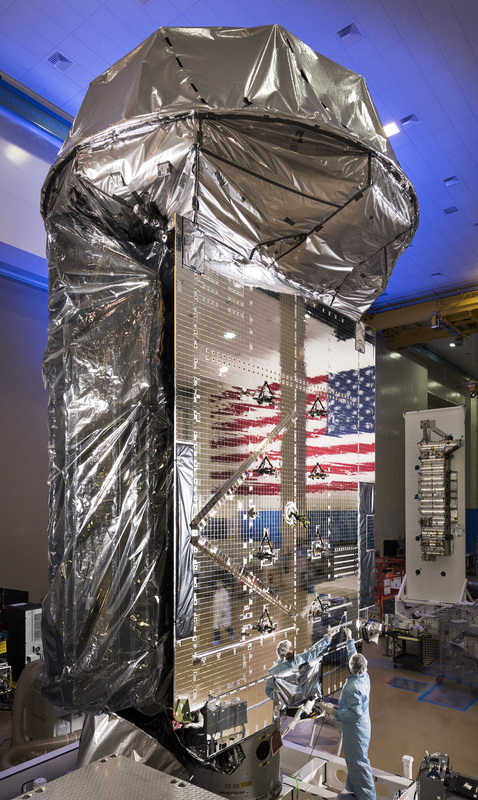 The MUOS 5 satellite is set for three months of in-orbit checkouts before being accepted into the existing MUOS constellation that requires four satellites to be fully operational, delivering global round-the-clock coverage. 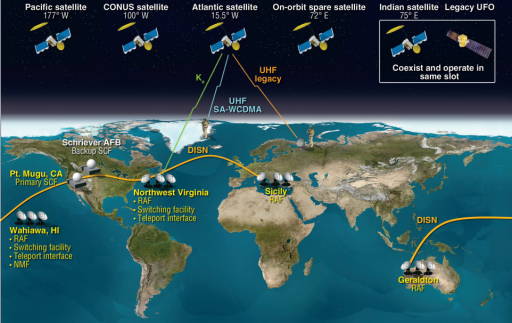 As the fifth satellite in the constellation, MUOS 5 was originally expected to move close to MUOS 4 over the Indian Ocean to reinforce coverage and be available as a spare in case one of its four companions in case of problems. 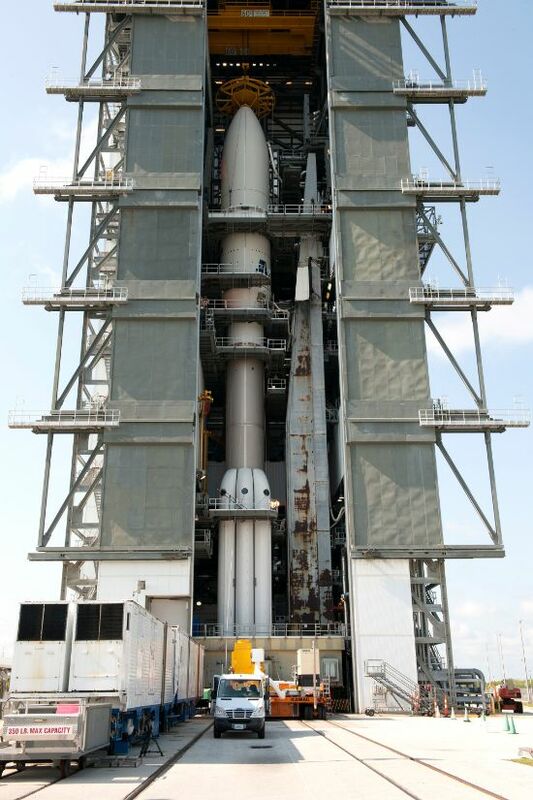 The U.S. Navy has not yet specified the impact the main propulsion system failure has on the MUOS 5 mission. The additional expenditure of Hydrazine fuel for orbit-raising will undoubtedly cut a number of years from the planned 15-year mission as insufficient propellant for Stationkeeping will be available. The current positioning of MUOS 5 is close to a special point in Geosynchronous Orbit at 104.92° West – one of two equilibrium points where satellites do not need to perform East-West Stationkeeping that is necessary for all other positions due to gravitational perturbations caused by the Earth’s non-circular equator. However, placing a satellite into a local low of Earth’s gravity will not have an effect on North-South drift caused by lunar & solar gravitation and, over time, will lead to an increase of the satellite’s inclination. As a communications satellite, MUOS 5 will only be useful up to a certain inclination, requiring controllers to carefully budget the remaining fuel for North-South control. 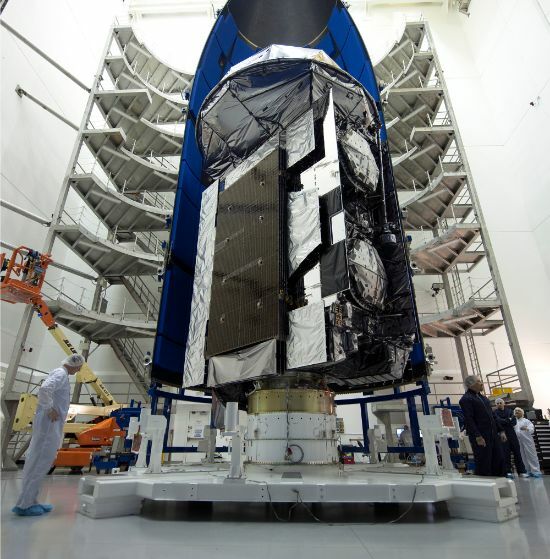 The problem experienced by MUOS 5 and a possibly related issue on the Intelsat 33E satellite prompted a postponement of the launch of the third Space Based Infrared System (SBIRS) Geosynchronous satellite. 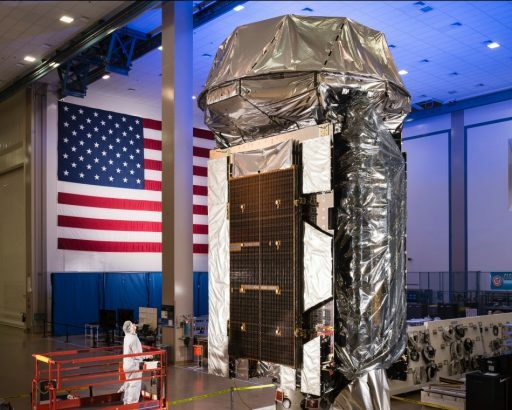 Officials decided a full review of commonality between the SBIRS, MUOS and Intelsat spacecraft was needed. Not all of them use the same main engine, but it is understood that propellant manifold and valve components on all three satellites are supplied by the same company. To access caution, the launch of the SBIRS satellite was pushed into early 2017 and detailed reviews into the cause of the thruster anomalies were expected to be completed in the October/November time frame. The $7.7-billion MUOS architecture replaces the UHF Follow-On System that has been in operation for two decades. The new system provides higher bitrates and uses the modern 3G communications standard also employed by cellphones.